Experience the record of your soul throughout all of time and space to align with the Highest Divine Soul Consciousness and Your Higher Soul Self and Ascend out of the Matrix shifting from lower dimensional consciousnesses to 5th dimensional consciousness and beyond. Understand your soul truth and receive divine guidance. Remember, learn from and heal past lives and clear karma. Step out of outdated or learned patterns and loops, fears and anxieties. Raise your vibration. Be as you are truly meant to be. Akashic Enlightenment allows you to access your own Akashic Records, the energetic database of everything your soul has ever experienced, for self enlightenment and ascension through the 11th density Book of Truth, the Universal Truth of which your Akashic Records are a part of, by using a 5th dimensional consciousness access prayer as your gateway to seeing the Book of Truth from your soul’s highest perspective. The Book of Truth is timeless and universal and is the big library of which your Akashic Records are but one hallway of. 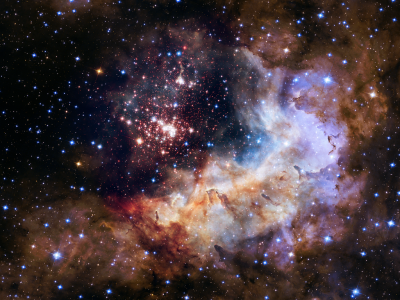 It contains the Laws of the Universe (our singular Universe and beyond) and God Creation as they truly are free of human interpretation and scientific theories and laws that are untrue bias or forms of ego upon God’s Will or ones True Will which is the same as God’s Will once one aligns once again with their True Will via their soul. Through the Akashic Enlightenment Gateway Prayer you'll experience your own Akashic Records and their Divine wisdom and knowledge of your past, present and future lives. Through this you are helped to understand better why you are here, how your soul is experiencing the ascension process underway at this time, who is helping you in this process and how, clear old energy to help you move along and follow your soul's path of Ascension instead of following outdated or learned patterns, fears, traumas and anxieties. 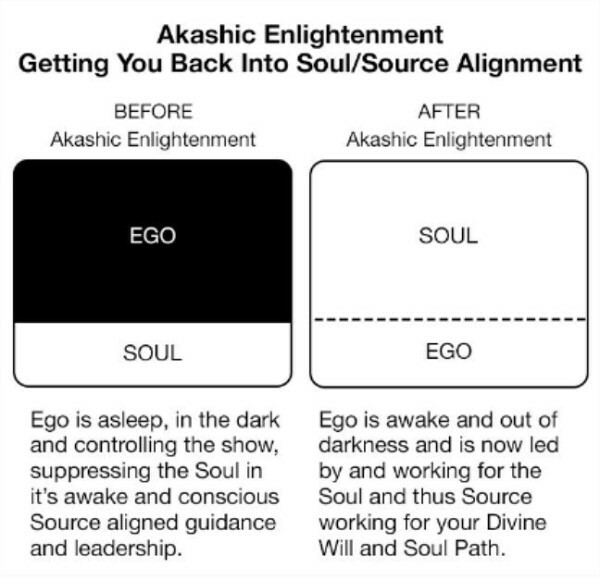 In addition, the healing energy of just being in your own Akashic Records and the Book of Truth also shifts you to a higher vibration which you will feel upon entering Akashic Enlightenment and which will help you align with who you are at your soul level. A good way to start although not required. Buy the book and go through the material. Then sign up for the Accessing Your Akashic Records & the Book of Truth for Self Enlightenment & Ascension class. Join the private online FaceBook Group for sharing, discussion and updates. Sign up for the Divine Love & Healing group monthly webinar where we will go over the Divine Love and Healing alignment practice on a regular basis seeing how we are falling out of alignment with love and giving in to fear and how we can better align with Love now. For those who are ready for the deepest Akashic Enlightenment experience and personal assistance and guidance along with Light Language upgrades as needed along the way, I offer one-on-one sessions where we will go through each class in 90 minutes as a 5 week series, so one 90 minute session each week. For those who don't live locally and would like a classroom experience for the courses you can take the online webinar with Zoom video intensive that will take you through all different training and alignment courses with a group of your peers. Purchse a 90 minute MP3 of me teaching the class to you plus a PDF booklet to follow along with and take notes in. For those who want personal assistance and guidance along with Light Language upgrades as needed along the way going through each of the trainings and alignment courses, I offer one-on-one sessions where we will go through each class in 90 minutes as a 5 week series, so one 90 minute session each week. In office or via Zoom video. 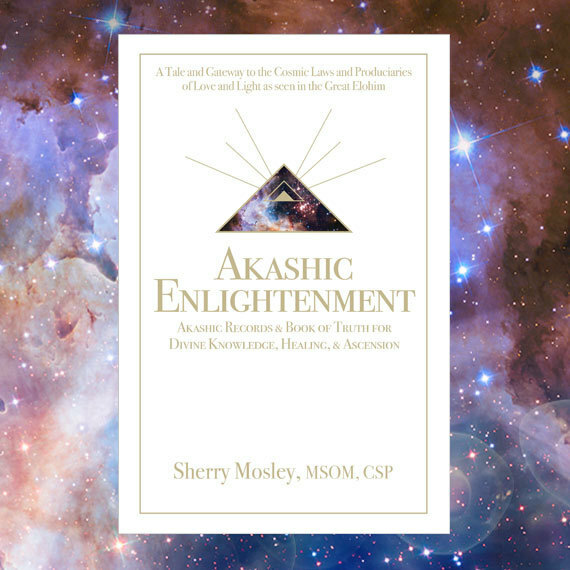 Akashic Enlightenment works with your personal connection to personal enlightenment and ascension through your own Akashic Records using the power of meditation and frequency or different brain wave/mind states and asking questions to bring instant clarity and manifestation of consciousness to you. This in and of itself will bring you to a higher awareness of who you really are and will teach you how to continue to align yourself in such a manner so you can maintain this consciousness and continue it to return back to Source/God/All That Is. The Akashic Enlightenment prayer is a sacred Akashic Record Gateway Prayer and works with your full legal name to open your own Akashic Records along with the Book of Truth. The course material is scribed and taught from the Akashic Records via Akashic Enlightenment thus it holds a consciousness resonance in reading or listening to it. This alone will assist you adjusting your consciousness and your personal ascension and self enlightenment. This class introduces to the Akashic Enlightenment method and how to use the Akashic Enlightenment Gateway Prayer to open up your own Akashic Records for self enlightenment and Ascension. It goes over what the Akashic Records and Book of Truth are and a detailed teaching of the 3 preparatory meditations of Running Energy, Golden Egg Energy protection meditation and the Shamanic Golden Chakra meditation techniques. It also goes over how to receive divine guidance and healing to your questions and concerns while in Akashic Enlightenment and help you discover your relationship with this method of spiritual growth and soul realignment. This class goes over the Akashic Enlightenment method with preparatory meditation techniques and how to use the Akashic Enlightenment Gateway Prayer to open up your own Akashic Records with the Book of Truth for self enlightenment and Ascension. It helps you practice using the Akashic Enlightenment method to read your Records for self enlightenment and Ascension with a focus on exploring who you are at a soul level and your own Ascension process including using an Ascension healing prayer. This alignment class usually brings in strongly felt and experienced energy alignments and upgrades. This class goes over the Akashic Enlightenment method with preparatory meditation techniques and how to use the Akashic Enlightenment Gateway Prayer to open up your own Akashic Records and Book of Truth for self enlightenment and Ascension. It focuses on you visiting past lives to see them in relationship to your Ascension process thus affecting the collective and Universal consciousness. They will help you to prepare and ramp up your soul to go further in this lifetime making these cosmically challenging transitions easier at this time. This course also puts you in alignment with your relationship to God/Source/All That Is, clears your energy to move you forward on your Ascension path and allows you to see current connections for what they are making you and your soul understand of why you're here in this life and why certain people are in your life now. This class goes over the Akashic Enlightenment method with preparatory meditation techniques and how to use the Akashic Enlightenment Gateway Prayer to open up your own Akashic Records and Book of Truth for self enlightenment and Ascension. It focuses you on seeing and understanding your soul lineages and relationships at a soul level and how they can assist your Ascension and self enlightenment process during these times of great cosmic evolution. There is a focus on your cosmic or star family ancestry and then your current relationships with family, friends and partnerships. 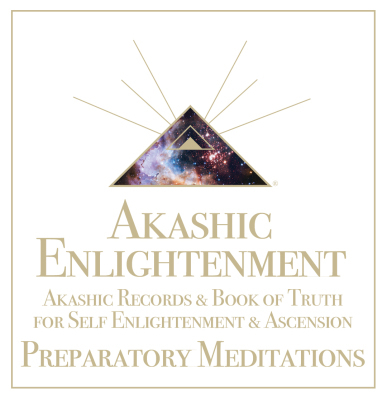 This class goes over the Akashic Enlightenment method with preparatory meditation techniques and how to use the Akashic Enlightenment access prayer to open up your own Akashic Records and Book of Truth for self enlightenment and Ascension. This class focuses you on opening to true Divine Love, seeing why you are not accepting it, as fear of love is the only thing standing in the way of your returning to your true Home as love is God/Source and all Creation. When aligned with true Divine Love, creation pours fourth from you creating a tapestry of divine bliss to be lived and experienced. This is THE only way to love as it is the only life and living that is actually real. It is truly free of the ego and aligned with God/Source. Akashic Enlightenment Level 1: Accessing Your Akashic Records & the Book of Truth for Self Enlightenment & Ascension: Introduction to AE, guidlines on using the AE Gateway Prayer, guided 3 prepratory meditations, fully guided question practice to walk you through your first soul alignment and transmission practice. One-on-one classes in office or on Zoom video for personal attention and flexible scheduling in learning this spiritual guidance and ascension alignment modality. Booklet for continued use at home. 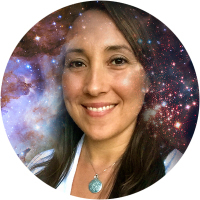 After you've done all 5 Akashic Enlightenment trainings, have one-on-one assistance in your personal Akashic Enlightenment practice, have questions answered, assistance in going deeper, better understand your results and how to improve them. See events page for current listing of group webinars. This Level 2 Akashic Enlightenment class helps you understand one of the most important parts of doing inner work, being clear in what you are asking for and in the interpretation of what is received. Knowing how to form clear and concise questions so you receive the knowledge, guidance and healing you are asking for can take practice and is also helping you form excellent listening skills which is a most part of being a successful reader. Good listening means great awareness and no reaction or filtering through your ego or what you DO know of yourself. This AE Level 2 class we will do just that, help you work on creating the best questions to receive the best answers and how to best interpret them for clarity. This is a necessary step before attempting to do deeper work for yourself or for others. This Level 2 Akashic Enlightenment class helps you reveal and look at unseen core wounds that are creating karmic patterns and loops in your life creating a looping reality for you until you see what it is trying to point out to you so you can step out of this and live in your more truly soul aligned self. Now that you are more awakened to your a soul level existence it's time to use this to step out of that which is no longer truly serving you. The protocol you learn can be used many times to release unecceary or diserving life patterns taking you off course of your highest soul aligned life course. You will also learn about the different levels or healing bodies of the body and how you are affecting each one with this and other healing modalities. This course will truly change your quality life and level of life satisfaction!! !